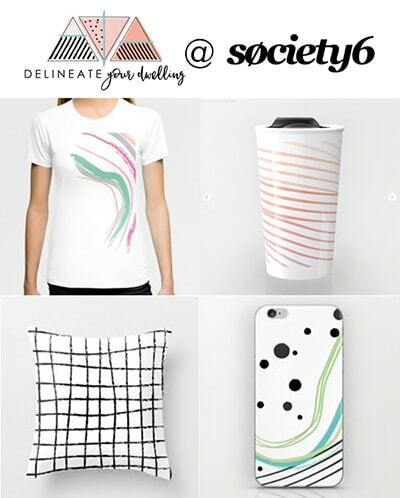 If you have been following Delineate Your Dwelling for very long, you know that I often like to mix up the typical color palette for Thanksgiving. There is just something about using rust, yellow, orange and brown that makes me sad on the inside… if you LOVE those colors, I say bravo! Make your home speak to you. Two years ago I used blue at my Thanksgiving table and last year I used pops of green with lots of metallics. 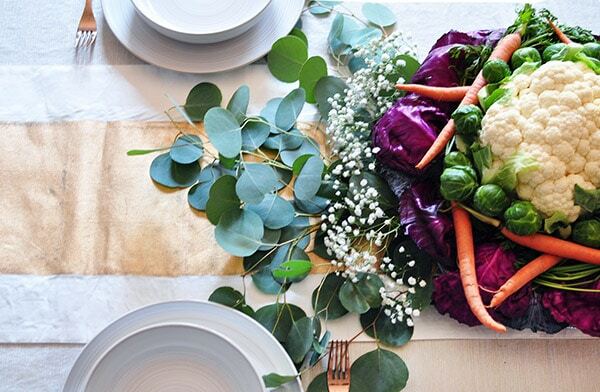 This year, I’m going very neutral white but adding in this gorgeous Thanksgiving Food Centerpiece. The best part is it’s all straight from my regular grocery store and only cost $38!! 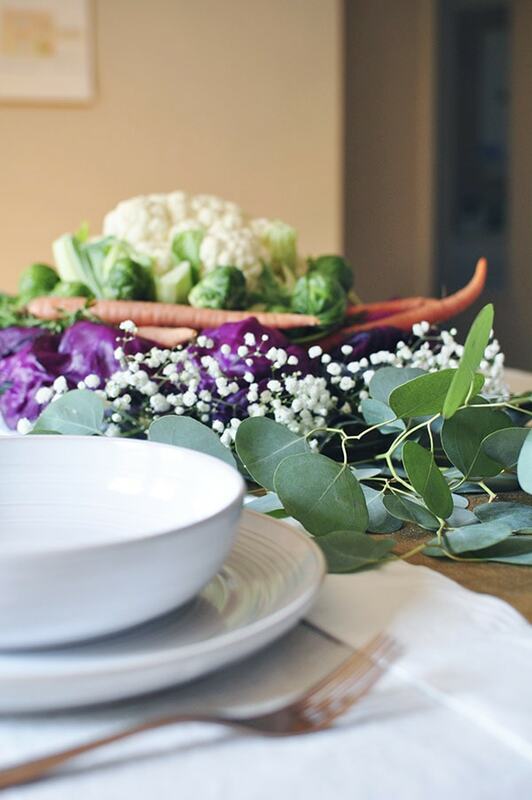 Like I mentioned, the best part is everything I used for this centerpiece came straight from my regular grocery store in the floral and produce sections. Plus with a price tag of only $38, you just really can’t beat it. Often I see these gorgeous floral arrangements on Pinterest and think that is stunning… how in the world would I ever recreate that myself? I took step by step pictures to show you just how simply this is to make. You totally got this! 1. Set out a table cloth, runner and a glass serving bowl. I used a chip/dip bowl but you could use any type of clear container, as it helps keep all those delicious veggies from rolling around on the table. 2. Lay out your Eucalyptus sprigs in a fan shape under the bowl. I tried doing the longest piece in the center and two smaller even pieces on either side. 3. Gently pull apart your red cabbage and place the leaves around the perimeter of your bowl/dish. Laying them face down seemed to work best for them laying more flat. Don’t be afraid to really layer them in there to provide a nice full look. 4. Next up is adding in the carrots. 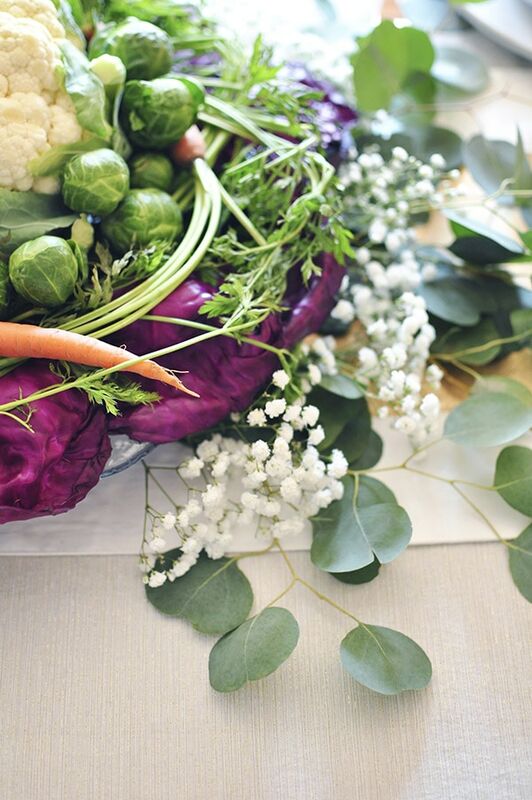 I opted to leave the leafy green stems on mine to add more texture in my centerpiece. 5. Grab yourself a Cauliflower and nestle him into the center of your vegetables. He should fit nicely right in the middle of your glass dish. 6. 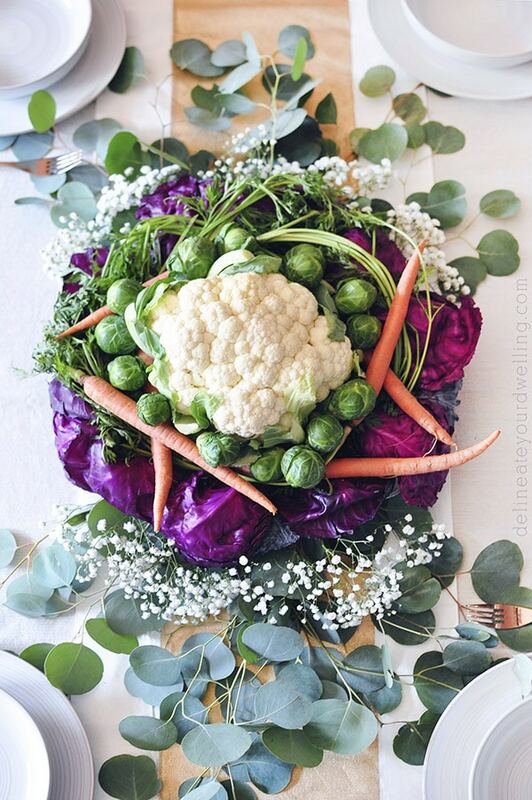 Add in Brussel Sprouts around the perimeter of your Cauliflower to help hide any open gaps. 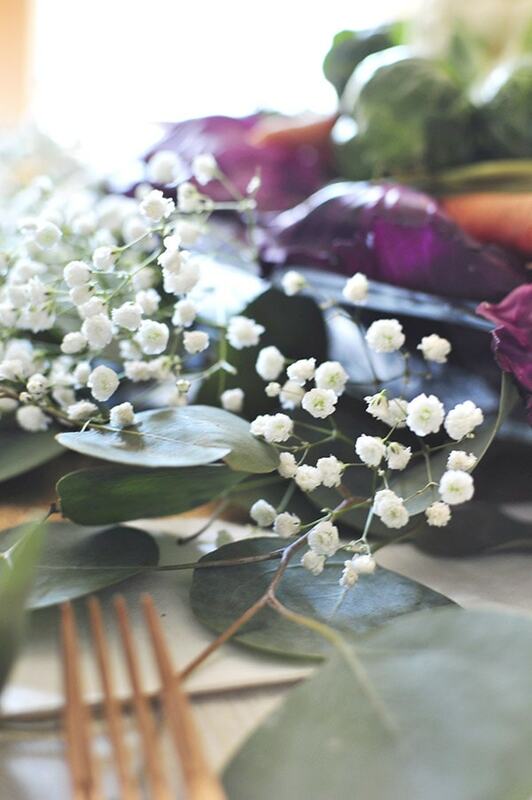 Lastly, tuck just a little bit of baby’s breath on top of the Eucalyptus leaves. I think I easily took 100 pictures of the completed centerpiece. I was so happy with the results, I wanted to preserve it forever! 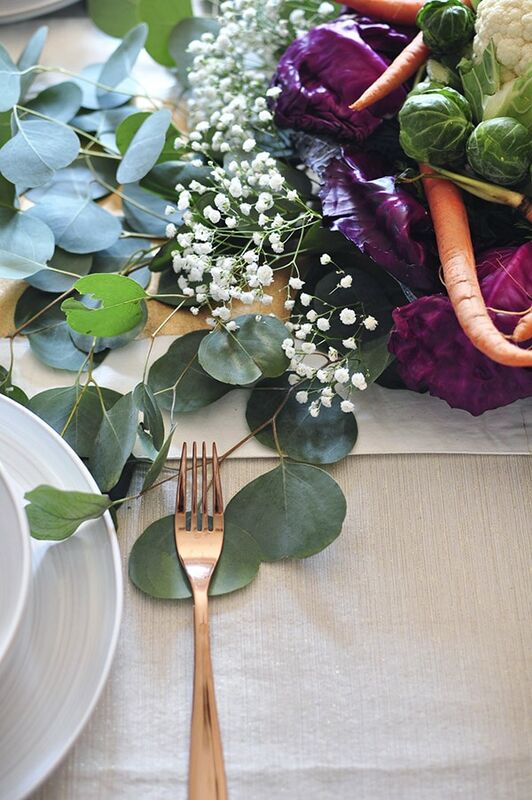 I love all the color and texture this brings to an otherwise very simple table. 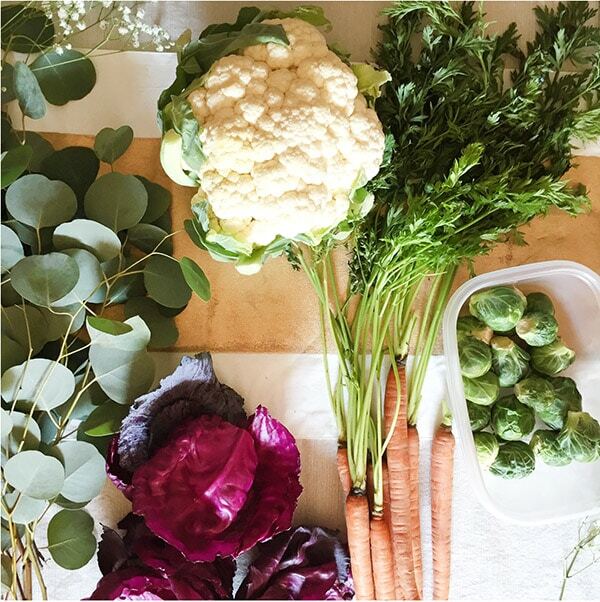 Since these all are edible vegetables, they would be perfect for using in an after Thanksgiving vegetable stew with your leftover turkey! 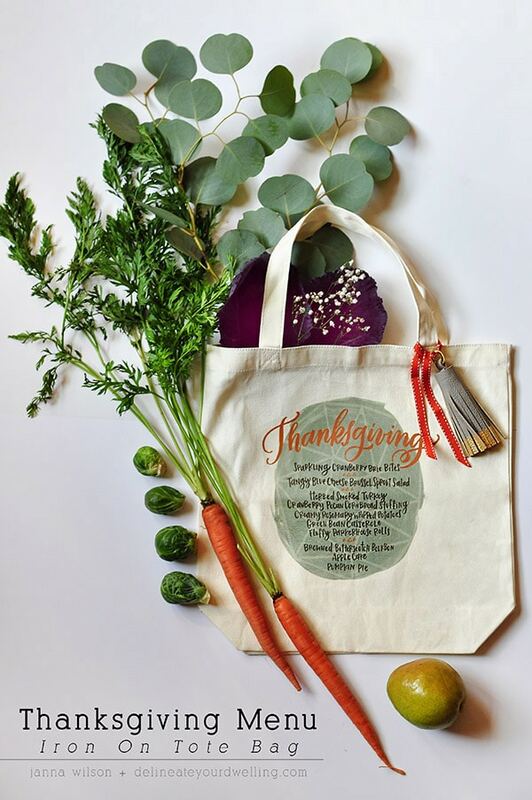 If you liked this Thanksgiving post, you might like this fun Thanksgiving Menu Tote craft! 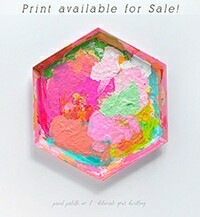 This is such an awesome idea! I think veggies are kind of under appreciated, they can actually be so pretty. I love all the comments, Kathy!! I know, I’m not sure I ever made another project that can serve so many purposes, decor and then food – ha! 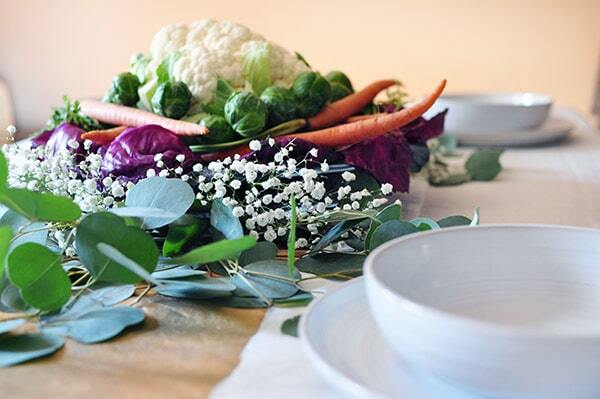 This is beautiful – so earthy, and I love that you can cook up the leftover display!! So creative and beautiful Amy! You can make anything look gorgeous! What a great idea! It turns out beautiful! It’s gorgeous, Amy! I love, love, love it! And especially love that it won’t just be thrown in the garbage the next day.